Author and teacher Linda Kohanov is a master of “the way of the horse,” an experiential wisdom gained by studying the nonpredatory power of horses. In The Five Roles of a Master Herder: A Revolutionary Model for Socially Intelligent Leadership, she adapts these horse-inspired insights into useful tools for developing collaborative leadership and managing change. “Master Herders” of nomadic herding cultures developed a multifaceted, socially intelligent form of leadership combining the five roles of Dominant, Leader, Sentinel, Nurturer/Companion, and Predator. The fluid interplay of these roles allowed interspecies communities to move across vast landscapes, dealing with predators and changing climates, protecting and nurturing the herd while keeping massive, gregarious, often-aggressive animals together — without the benefit of fences and with very little reliance on restraints. 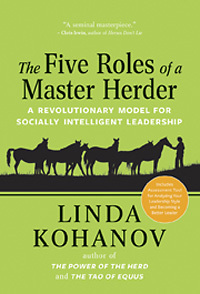 We hope you’ll enjoy this post by Linda Kohanov based on The Five Roles of a Master Herder, focusing on the role of Dominance and how to use it in a productive and powerful way in the workplace as well as greater communities. Whether you overemphasize or avoid the Dominant role, learning to employ it consciously and judiciously is one of the most important — and difficult — skills to develop. In working with large animals, Master Herders cultivate a sophisticated knowledge of dominance to handle the flamboyant power plays that aggressive herd members engage to challenge authority and intimidate others into submission. Similarly, parents and teachers must help naturally dominant children modulate and channel this sometimes-explosive force into benevolent pursuits. Here’s the problem: Managing, let alone working for or living with, people who overidentify with the Dominant role is sometimes emotionally painful, intensely frustrating, and even occasionally dangerous. In these efforts, you must not only be powerful yourself, but you must also model a centered, socially conscious use of this often-misdirected force — even if dominance is not your natural inclination. If dominance is your native tongue, you must transform your own instinctual tendencies to control,intimidate, and divide and conquer into an impeccable source of refined influence. Either way, it may be the challenge of a lifetime. To various degrees, naturally dominant people and animals experiment with using intimidation as a management tool. At best, they have strong opinions and aren’t shy about directing others’ behavior. The most dangerous Dominants, however, quickly escalate to violence while displaying an outrageous sense of entitlement. Humans who overemphasize dominance play similar games, though most of these people are unconscious of what they’re doing and how they affect others. To some high-powered CEOs, intensely autocratic behavior becomes their baseline — usually through a combination of talent for this role reinforced by parental encouragement, followed by success in competitive educational environments and cutthroat business climates. In the corporate world, large salaries still entice many workers to endure intensely competitive, demeaning bosses. Younger generations, however, are less tolerant of disrespectful power plays and “my way or the highway” tactics. Talented, independent people are more than happy to “hit the road” in these situations, especially when the internet makes it easier to work from home and start a business online. · Uses intimidation as a management tool. · Exhibits a strong sense of entitlement. · Often asserts power divisively, usually by keeping others away from something valuable (food, water, resources, mares in heat, and so on). · Sometimes attacks others for little or no reason (to keep everyone a bit on edge). · Pressures others to yield, to look away or move away asa sign of respect. · Refuses to move when others ask. · Herds others with a driving force, most often by pushing the group from behind. · Exhibits tendencies to micromanage, demand compliance,and control others’ behavior. · Verbally or nonverbally expresses a “my way or the highway” attitude. When dominance is used consciously — in balance with skills developed through exercising the other roles — it becomes a constructive force for motivating others and moderating unproductive group behavior. Mature Dominants transform their potentially explosive energy into a“direct-and-protect” orientation, deftly employing the role’s divisive and driving forces for specific, life-enhancing pursuits. While the their adolescent counterparts are busy chasing herd members away from food and water, horses who master this role use their refined, still-potent power to break up fights between individuals (divisive), set boundaries with aggressors (divisive), herd the group away from danger (divisive and driving), and chase off predators (driving). In pastoral cultures, expert herders employ dominance for these same purposes, while helping their younger counterparts convert disorganized aggression into focused, intelligent assertiveness. During seasonal migrations, Fulani herders regularly employ the divisive energy of this role to keep loose cattle out of farmers’ unfenced fields, thus preventing war with the tribe’s sedentary neighbors. Accomplished human leaders use the Dominant’s driving energy to motivate lazy or resistant individuals to get back on task and/or to change destructive behavior. The driving force can also be used to help groups stay together and persevere through the uncomfortable by-products of change.During droughts and economic crises, the Dominant’s protective,boundary-setting abilities keep predators at bay and prevent opportunistic herd members from hoarding or hijacking limited resources. · Has a “direct-and-protect” orientation. · Excels at setting boundaries with aggressors. · Herds others away from danger. · Motivates lazy or resistant individuals. · Socializes adolescents to use power appropriately. · Directs group members toward common goals. · Protects valuable resources fromthose who would take advantage. Until I learned to work effectively with dominant horses, I had no idea how to use this role constructively, let alone how to help naturally dominant humans transform their tempestuous power into a conscious, relationship-enhancing force. The following four “power principles” will help you handle aggressive energy with dignity and poise, while forging stronger,mutually supportive relationships with naturally dominant people and animals. PowerPrinciple One: Pay attention to body posture and breathing, using both as nonverbal communication. PowerPrinciple Two: Distinguish between setting boundaries and motivating others, using the assertiveness formula to employ power as needed. PowerPrinciple Three: Do not take dominance games personally. PowerPrinciple Four: Resist the temptation to enlist a Dominant to compensate for others’ avoidance of this role. Instead, coach all staff in the appropriate use of power. Linda Kohanov’s equine-based books have sold more than 163,000 copies. Through her company, Eponaquest Worldwide, established to explore the healing potential of working with horses, she teaches internationally on subjects including leadership, social intelligence, and stress reduction. She lives near Tucson, Arizona. Based on the book The Five Roles of a Master Herder. Copyright © 2016 by Linda Kohanov.